Besides servicing boats, Hale’s Marine also transports large and small craft — almost anywhere. Ed soon realized that there was a need for good, honest and reliable boat repair and so began the creation of Hales Marine Services in 1996. With a Red Van, his tool bag, mechanical knowledge and good customer service instincts, Ed changed the standard for quality boat repair in the Valley. After long hours, running a tight ship and lots of blood, sweat and hard work, Ed became well known as one of the most reliable boating-repair shops in town. While working hard in the boat repair industry, Ed soon realized that he could provide the same qualities he was providing in boat repair to the transporting of his customers’ boats. In his typical “Hale style”, Ed went straight out and bought a semi-truck and trailer and taught himself to drive it so that he could get a C.D.L. and begin transporting his customer’s boats. With word of mouth and proven attention to detail, the demand for Hales Marine Services/Transport began to increase and the birth of a transport division was born. 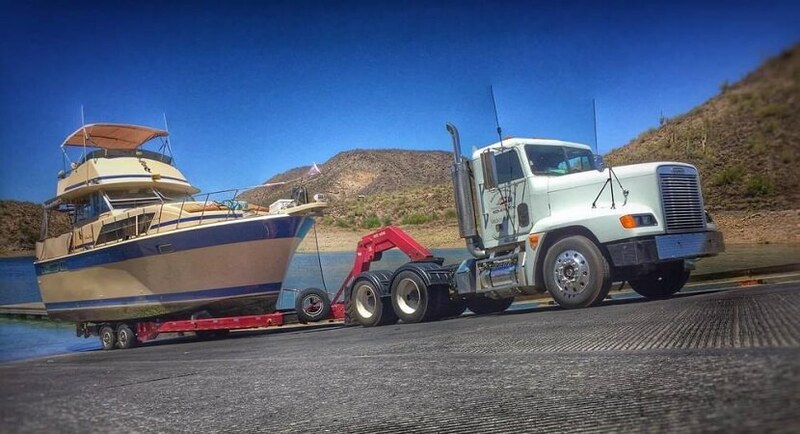 Along the way, there have been many trucks and specialized trailers not only to transport the Hale’s Marine Services repair boats to and from the shop, but also to transport boats across the nation. There is no-one else in the area who has the experience, knowledge and equipment that Ed Hale has, which is why he is known as the “go-to guy” for transporting the big and beautiful cruisers, pontoon boats, and house-boats. If you haven’t had the experience and satisfaction of being a Hales Marine Services customer yet, they look forward to meeting you and welcoming you to the Hale’s family. Editor’s Note: Jim and Carol Allen have called on their friend Ed Hale many times over the years to move “old wooden boats” from San Diego for the “Rock The Boat” project and most recently, to help them move their Balboa to Lo Lo Mai Springs near Page Springs, Ariz.